In peritoneal dialysis, the patient’s peritoneum (membrane present inside the abdomen) is used for the purpose of dialysis. Peritoneal dialysis occurs within the patient’s body itself. For peritoneal dialysis, a tube called a catheter is surgically placed through the wall of the patient’s abdomen as a permanent access for peritoneal dialysis. The catheter is usually placed about an inch below and to the side of the navel. About 2-4 inches of the catheter extends out of the body. NU Hospitals, in collaboration with Baxter, has set up a CAPD center with a coordinator trained in CAPD manning the center. At the center, patients are initiated on CAPD. Patients and their attendees are also educated regarding the procedure, hygiene, etc. 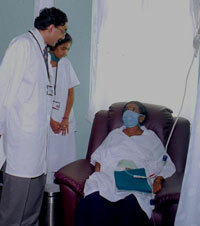 Counseling about the various options available for patients with end-stage renal disease is also done. The center also possesses a cycler machine that enables patients to undergo CCPD when required. This process is completely automated.